It's very nice when the Gazette writes stories based things I write in this blog. It would be even nicer if such stories acknowledged this blog as their source. Just basic good manners, don't you think? I'm out of town just now, visiting my mum, which is why I've been slow to deal with readers' comments this week (there's just one internet shop in the neighbourhood and it's full of Warcraft junkies eating very noisy sweets...). Apologies for that. I'll be back in business properly by Friday. Keep 'em coming. "To the newly refurbished Stamford Hill library. First impressions are good: airy, light, spacious, new wooden shelving, increase of computer terminals and fresh carpet. The new bank of computer terminals is away from the prying windows of the Portland Avenue side of the library as are the poetry, history and other non-fiction collections. In their place is the children's section which appeared, from a distance, to be much more colourful and playful. I visited the library at lunch time and it was awash with young chasidic men surfing the web." Heard of Channel 4's Street Weapons Commission? It's a panel of experts trying to figure out how to reduce the carrying of guns and knives. Chaired by Cherie Booth, its members include Gus Johnson, formerly Hackney's education director. Among those called to give evidence are Jules Pipe and Hackney's borough police commander Steve Dann. 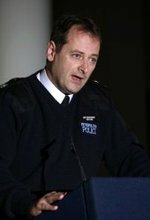 There's a lot of stuff about Operation Curb, and some fascinating insights into the various initiatives taken by the police and others so try to prevent children joining gangs. Among other things we learn that our local mobile intervention unit cost £750,000 per year and that Dann would like to double its personnel. Also, he doubts that the drug trade is "the main driver" of gang crime and says that Hackney police go in for more stop-and-searching, arresting and charging than other London boroughs. See the interview here. Cllr Akehurst goes to a birthday party. David Cameron, Broadway Market & More "Regeneration Arguments"
"What seems entirely missing on the part of the politicians and management consultants who decree these reorganisations from on high is any awareness of the social impact the decisions will have. Paul Kingsnorth, in his powerful new book Real England, tells a story from the heart of urban London that will resonate with many rural people. Broadway Market is a well-known road in Hackney with a lively street market and many small independent stores. It's traditionally been a focal point for the local community. In other words, exactly the sort of place that should be valued and conserved. Yet when Hackney Council, mired in debt, discovered that it owned the freeholds of many of the shops in Broadway Market it sold them off to developers willing to pay the highest price. The inevitable happened: rents went up; eviction notices were served and the little shops and cafes so valued by the community started to disappear. Many country people will empathise with the citizens of Hackney. They have that same sense that distant and unaccountable decision makers, led by management consultants and accountants, are undermining communities by undermining the institutions that bind them together." Sounds a bit like Michael Rosen, doesn't he? Which all goes to show how contradictory and confusing these issues can be. And, perhaps, how clever Cameron is. More stuff on the Broadway Market saga from Hari Kunzru here and Patrick Wright here. The market's own website is here. My eldest child was born almost 24 years ago at the Mothers Hospital in Lower Clapton Road, since demolished and replaced by Mothers Square. I lived in Homerton at the time and barely knew the neighbourhood where my daughter was born and I now live. Following her delivery and the departure of her visiting grandparents I wandered outside and down the street, waiting, I suppose, for the significance of the morning's events to sink in. Also, I was hungry. This is the shop I went into, just before the traffic lights at the junction with Urswick Road. I wish I could remember what I bought there. Anyway, I've always remembered the shop, and taken my custom there again from time to time. Judging from the estate agent's sign, the refit it's undergoing prefigures a change of owner and, probably, of use. That's slightly poignant for me: a little fragment of my past erased. By never mind, I still have my eldest daughter. 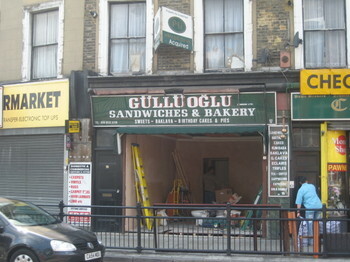 I fact, she's visiting just now and she too is glad to have had a last look at the Gulluoglu bakery before it disappears. Wardrobe issues, near Victoria Park.